when i saw this blazer at the last post – i knew i would love it on you! you look amazing in it! Gorgeous Blazer! If you like poetry you should read my blog! I’m just beginning though, so I’d really appreciate consructive criticism. 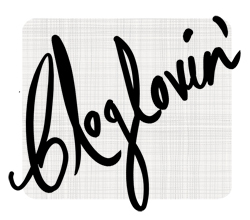 And, your blog is amazing, im a new reader and I love it! VERY cute ring! Love Primarni for those little accents! I may know someone who knows someone who heard a rumor that her friend is contemplating extensions … what are your thoughts? Do they hurt your natural hair? Do they “feel” real? Fantastic 80s blazer! 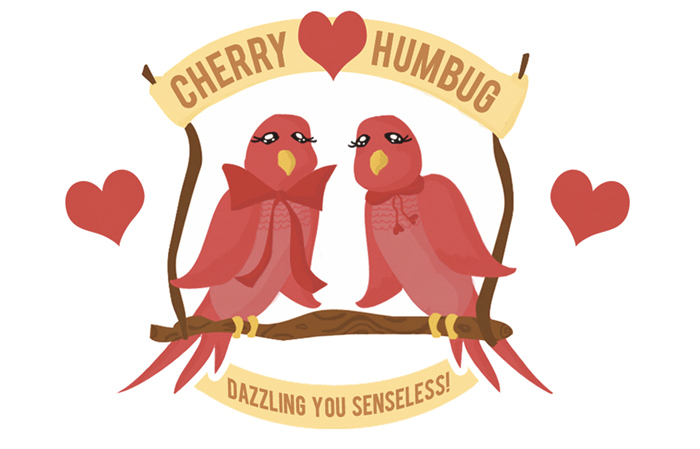 You are sure to sTEAL hearts. I love the color green. Your nail polish color is awesome, the ring is a special added touch to this look… love it! Gorgeous outfit, and I am in love with those shoes! I really like the green, especially the shades that you are using. It makes you look calm and collected. I have to have that nail polish. Love the green blazer too! Nice nails format and of course, color 🙂 Beautiful blazer too. very nice nail color.. blazer is also wonderful. wauuuuw really pretty ! love it! cute outfit! love that green polish, what brand is it? Love the nail color — I just got a gorgeous jungle-green shade from OPI: I’m Cuckoo for This Color. I’ve gotten compliments! love the nails! the blazer is great too…kinda reminds me of the masters green jacket (golf, that is). thanks for sharing. Have to agree, the nails are pretty sweet! Congrats on Freshly Pressed! You have such a cute blog, and I adore your style — this look has a kind of vintage feel, but it’s fresh and polished at the same time. I love the green colors together, and that teal blazer with the gold buttons is a fantastic piece. Your hair is gorgeous, I would never have guessed you had extensions. I too feel more “myself” with longer hair…I don’t think I’ve ever had it cut anywhere above my shoulders since I was, like, two. You’re very elegant! ^^ I was searching for some fashion blogs of quality. Sorry for my approximate English … I hope it is understandable. That blazer is such a good find! Green nails are the way to go! My toes are green right now, and my fingers are usually teal. like the green nails and cute heart ring! love the blazer and the nails! green is my power color! yay! 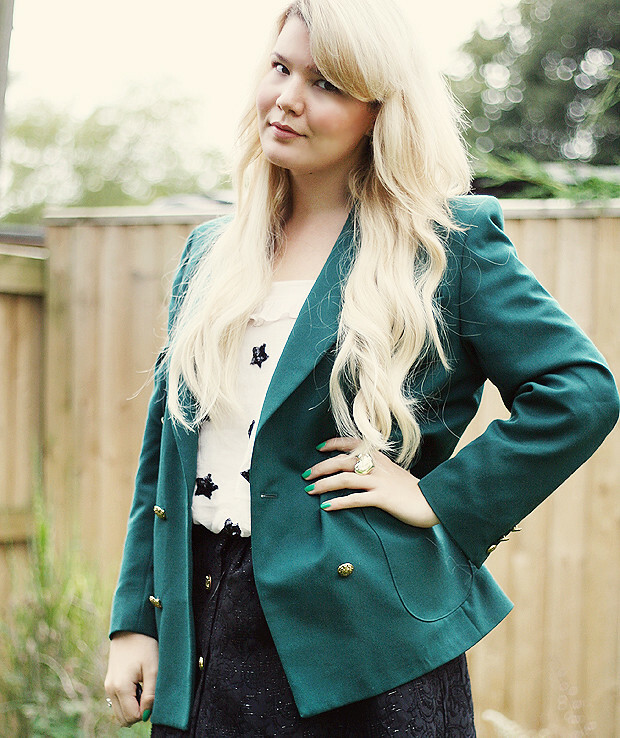 I am a big fan of blazers,love the green-it’s very unexpected. 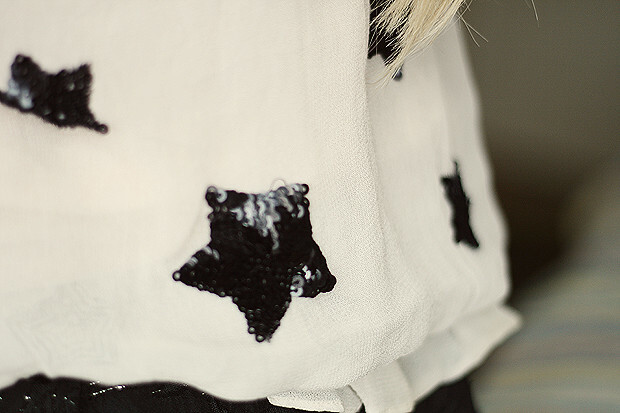 So cute – love the stars! Incidentally, if you’re ever in the Lake Superior area, you should get an agate ring. They’re cheap, come in all colors, and look a bit like impure jade. I got mine in Minnesota, but they probably sell them at other northern beaches too. You’re such a lovely gal! I love the your choice of color– green! I love the blazer, you look gorgeous! And the ring is super cute too. What a cool blazer! I love hearts too, so the ring is a nice touch. (I’m jealous). You look fab! OK so my wife just asked what the hell I was doing looking at your post. 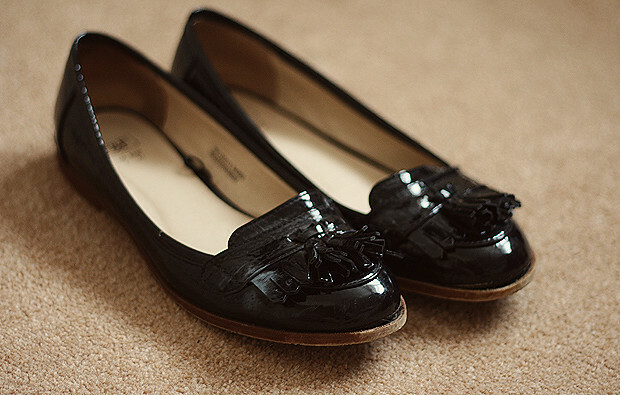 I love the loafers! pure chic! Wow,this outfit is cute! Am I saying the right thing when I say that this is vintage?I’m pretty sure that outfit is vintage,if it is vintage that’s good because vintage is in! You’ve put the outfit together so well! Not many people can pull of this particular shade of green, especially on nails but you most certainly can! Yes I’m green with envy, Love your post! I LOVE the ring! You’re such a fashionista!!!! Love the nail colour and your adorable ring! WOW , you’re gorjuss . and you have a great sense of style . Oh my days, super gorgeous! Much love from Romania! Thrift shop finds are the best! I volunteer at one where I unpack the donations which means I have first dibs. Rarely is it that I don’t come home with something. Nice! Beautiful girl….and nice picture. Everyone seems to have such professional extentions these days! I’m glad you’ve been getting lots of wear out of that lovely new blazer, and simultaneously enjoying the summer. I always think it’s quite a blessing to be unemployed in the summer! I look like this article and woman picture!! It’s very great!! I love your color combination. Been looking for a calmer turquoise coat for the winter. Something like yours. I like to pair with black and rusted gold. Love your color scheme, did I mention it? I’m loving the blazer! Too hot for Texas weather right now but when fall hits!